Networks describe relations between objects. They show how objects relate to one another and which ones are mutually influential. In this context, how does space impact structure? Geoinformatics scientist Dr Franz-Benjamin Mocnik was particularly interested in answering this question. In his study, the Heidelberg University researcher demonstrated that the spatial reference can be identified in a number of datasets of different thematic networks. Thereby, the dimension of the space – that is, the spatial expanse in different directions – can be derived from the abstract structure of a network alone. The structures described by networks can be found universally in many fields, such as with respect to road traffic, communications, the Internet, social media, and biology. Many of these networks exist in space, thereby “inheriting” their properties from it. One main property of space is its dimension – how far it extends in length, in width, and, where applicable, in height. The network of the bus routes in Manhattan, for example, is two-dimensional; yet the networks of brain structures are three-dimensional. According to Dr Mocnik, little research has been done on how space affects the structure of networks. What has been studied is how spatial aspects are reflected in the datasets of a network when its exact location in space is known. In his study, Dr Mocnik took a different approach. Using different real-world networks, he demonstrated that the dimension of a space can be inferred solely from the structure of the given network without prior knowledge of its exact spatial reference. 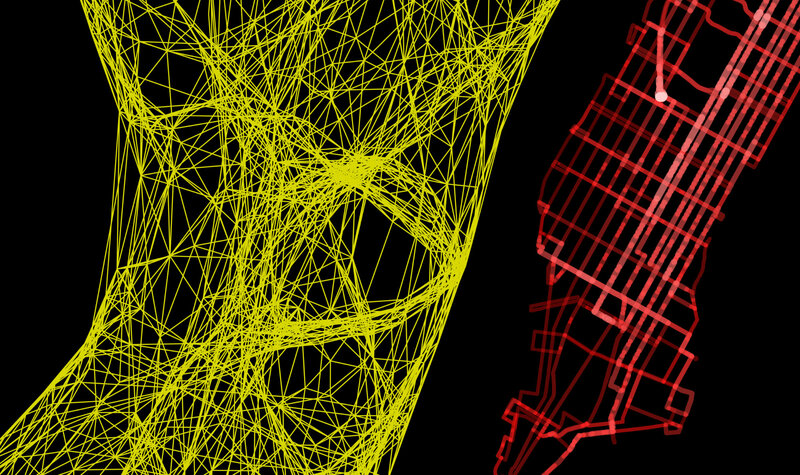 Without knowing the location of the Manhattan bus routes, for example, its network dataset points to its spatial reference and elongated shape. “While that may sound trivial, this fact takes on a whole new meaning considering that even social media networks are found in space with respect to the individuals acting in them, even though the dimensional aspect is not paramount,” says Franz-Benjamin Mocnik. “The same is true for airline routes; while they do have spatial components, they are dominated by other aspects.” The researcher also demonstrated that certain factors can lessen or even conceal the influence of space on the structure of a network. “To some extent, however, this influence is quite stable. Even when hierarchies exist, they do not destroy the spatial structure within a network. Real-world networks evidence structure-inducing mechanisms,” explains Dr Mocnik, a member of the Geoinformatics Group of the Institute of Geography. The Heidelberg researcher points out that the structural identification of spatial reference is particularly important in analysing global challenges such as climate change, access to water and energy, and the fight against epidemics. The research results, which are also relevant for the optimisation of algorithms, were published in “Scientific Reports”.